I bought Oikos to use as my starter, and Horizon whole milk for the batch. If I’m gonna make this, might as well go all out, right? I says to myself, and agreed. After leaving the milk at Kroger (doh! ), but thankfully having relatives who work there and brought it home for me, I was still able to power on. The only complaint of the house was that the milk made the kitchen smell bad; even to my currently too-sensitive sense of smell, it wasn’t really offensive, but I guess it depends on how often you scald dairy in your home (like for crème brûlée, or pâte à choux, or any other French-type thing with funny accent marks). I decided not to do flavors this time around, just because I wanted to see what kind of yogurt I was dealing with, and I wanted to have something to use as a starter for the next batch. 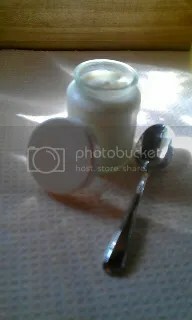 Despite the sharp tang of store-bought yogurt used as a starter, the homemade was mild-flavored, almost sweet – with a bit of Georgia honey and some chopped almonds, it was the perfect breakfast. Heat milk in a medium saucepan over medium-low heat, stirring occasionally, until small bubbles appear around the edges. Do not boil! Remove from heat and let cool to room temperature. Add yogurt starter and mix in thoroughly. Pour into jars and process according to your preferred method – via yogurt maker manufacturer’s instructions, in a cooler, or via alternate means. Refrigerate 3-4 hours after processing before consuming. Add flavoring, fruit or other additions after processing (according to Deni manufacturer instructions – opens *.pdf in a new window). 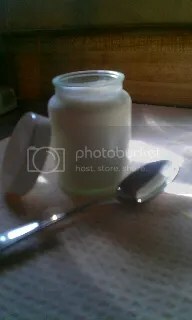 This entry was posted in Food and tagged Dairy, DIY, Homemade, Yogurt by Kate. Bookmark the permalink.